Your interactions with these people are likely to be very different. Shared experience, familiarity and knowledge of a person’s likes and dislikes are all going to affect the way you talk to them and what you talk to them about. Tailoring what we say to our relationship with the person we're talking to is something that usually comes naturally, but when you apply this to ecommerce and the way that retailers communicate with their prospects, it’s amazing that many are still talking to customers using the same undifferentiated messages, regardless of how well they know them. But when we take context into account and make our marketing more relevant to each customer’s circumstances and relationship with our brand, they’re more likely to engage with our messages and buy stuff (and keep coming back for more, too). 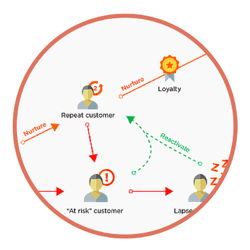 And it’s this idea - of developing a core base of active, loyal, revenue-generating customers - that lies at the heart of customer lifecycle marketing (or CLM, for short). As far as you’re concerned, the more of this type of customer you have, the better, and everything you do in your lifecycle marketing efforts should be geared around nurturing customers into this status. Confused? Here’s a diagram of the different stages of the customer lifecycle to make it clearer. We’ll talk a bit more about each of the stages below. How an online retailer defines what 'active' means will very much depend on their business model and product lifecycle. You may already have a definition of active customers, but one way of working this out is by using what we call 'order gap analysis' - a more detailed explanation of which can be found in this webinar recording (at around the 6m15 mark). One-time purchasers - those who have recently made one purchase. Repeat purchasers - those who have made more than one purchase and are buying at their expected purchase frequency. 'Hero'/VIP status: whether a customer can be considered one of your 'top' customers (usually calculated by lifetime spend, number of orders and recency). Many of these strategies and more are also covered in our customer lifecycle email marketing playbook, which you can download here. Customers require different messages at different stages in their relationship with your brand in order to maximise the revenue you make from each of them. The customer lifecycle is a really useful starting point for framing these messages. Working out who your 'active' customers are by examining customer purchase behaviour is a great start - and from there, you can begin to identify customers who are at risk of lapsing and who have lapsed. Once you can identify which prospects and customers fall into which lifecycle stages, you can create marketing campaigns aimed at activating them.